The Southern Oregon Regional Program for the Visually Impaired (PVI) is currently implementing SAL, a new and exciting curriculum tool through an innovative grant. 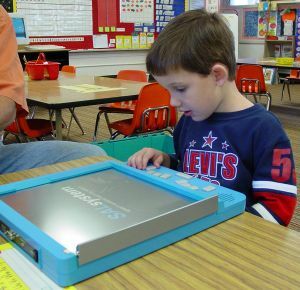 Speech Assisted Learning (SAL) allows a teacher of the visually impaired to redesign his/her Braille instructional time by programming the new SAL tactual hardware with auditory feedback, and providing extended teaching and training time to students. Through support from the Cow Creek Umpqua Indian Foundation, Gordon Elwood Foundation, and the Southern Oregon Lions Sight and Hearing Center, the Program for Visually Impaired was able to buy the state-of-the-art hardware and software that could revolutionize Braille instruction. Utilizing such innovative instructional curriculum tools, such as the SAL, is a great example of collaboration and cooperation amongst private foundations and PVI. This helps ensure quality and cost effective specialized instruction for a low-incidence population in our rural region. Thanks to all who made this possible!